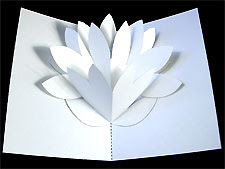 Robert Sabuda is an award winning 3-D paper engineer and children's book artist with a long list of titles to his credit. 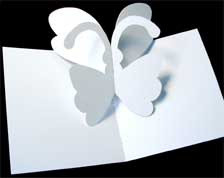 He's been creating captivating, movable paper ideas ever since he was a young boy. The Chronicles of Narnia and Encyclopedia Prehistorica: Dinosaurs with its fierce T-Rex, are two popular titles. 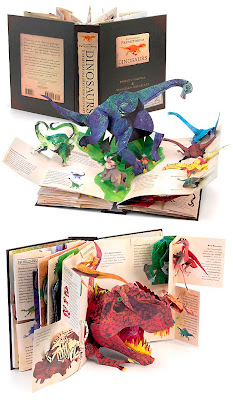 Robert, his partner, Matthew Reinhart, and a team of designers produce cleverly detailed pop-up books that bring classic and original stories to life. 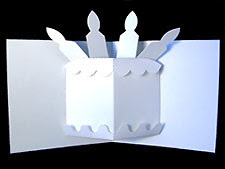 Check out Robert Sabuda's website - he has generously posted templates and how-to instructions for making these nifty cards, plus many more. If you've ever wanted to give pop-up designs a whirl, now's your chance! I read through most of your blog this evening and really enjoyed the mix of projects and links. Quilling is one of the few paper crafts I have NOT tried. Maybe it's time? Hi Carol, thanks and yes, give quilling a try! I visited your blog and enjoyed it very much. Have saved the addy in my faves list. I always enjoy seeing anything that Robert Sabuda does. I've given many of his books as gifts; come to think of it, I should get a few for myself! Thanks for the fun post.